For those getting into their first place, here's a little room re-do inspiration. 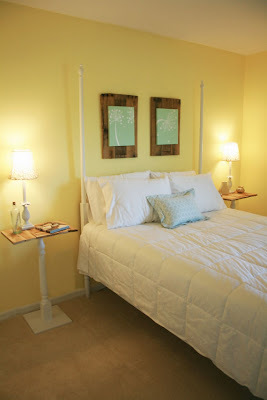 I recently finished my guest room and I'm thrilled with the results. 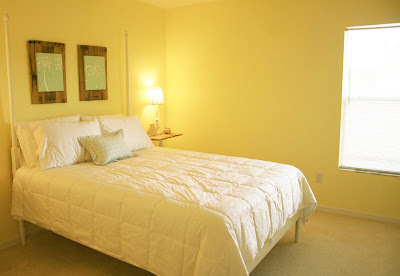 Most of the guests who would be staying with us would be coming from the North, and most likely during the winter months, so I wanted it to be a bright and sunny "Florida" room to get away from the snow. Here is the before And here is the lovely after. Does this even look like the same room!? A little paint, a little love - goes a long way! I had a really hard time finding night stands that I liked - so of course I set out to make my own! I wasn't looking to pay $50+ for each night stand, so by making my own I used some old salvaged wood, and a few dollars spent at Lowe's, I have two custom made night stands for $12 each. 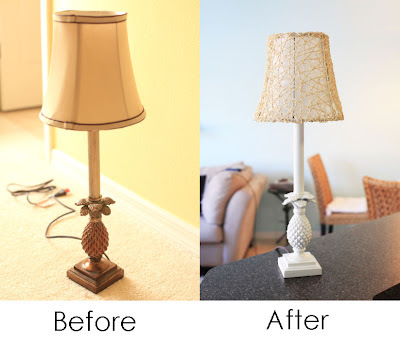 Here are the before and after photos of my lamps. I picked these up super cheap ($9.99 each!) 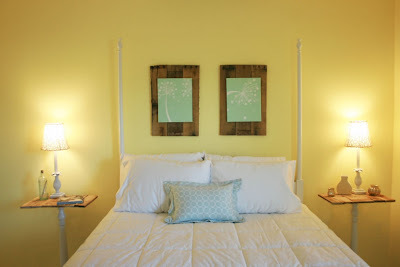 because I knew they would match great with the small pineapples on the ends of the bed posts, but the color wasn't right. I spray painted the bottom white, which was an easy fix, but the lamp shade is welded onto the bottom portion. So my options were to cut the metal off and find new lamp shades, or try to work with it. Of course I went with the DIY route, so I took off the outer beige fabric and left the white lining. I bought 4 placemats from ikea that are a tangle of rattan like twigs (only $1.99 each)and I used two for each lamp shade. A little hot glue, some scissors, and they came out great! 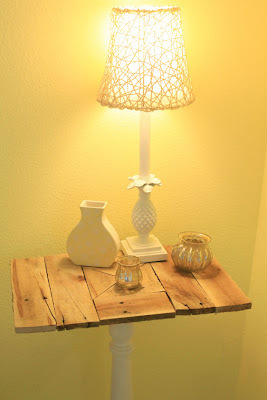 A custom lamp for under $14 each - you sure can't beat that. After I had the bed and night stands in place, the room needed something on the walls. 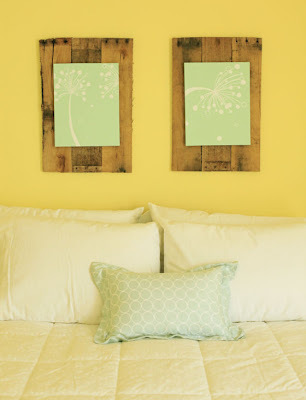 I didn't want to use personal photos because I really wanted the room to have a "hotel feel" for our guests. I decided to pull out my paint brushes and a couple canvases to make some custom art for the room (I was on a custom roll with everything else!) 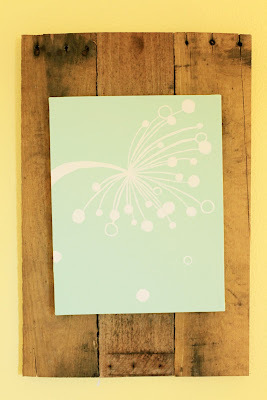 I used the same paint color on the canvases as I used in the en suite bathroom to tie it all in. I'm so happy with how my paintings turned out! 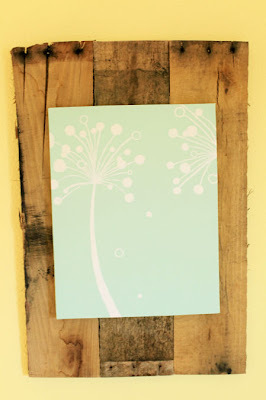 I love the old, distressed wood under the clean crisp colors of the painting. So there's my guest room! I had a great time working on all of the projects, and I hope it gives you a little inspiration of your own. Well, I'd have to say this is one of my favorite before and after room changes. I follow a fair amount of blogs/craft RSS feeds and I think you should definitely post this on one of them!